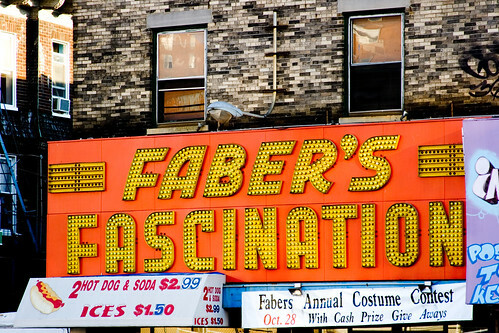 After more than 50 years, the fabulous lightbulb lettering on the front of Faber’s Fascination, an arcade that was one of Coney Island’s oldest year-round businesses, will no longer light up Surf Avenue. 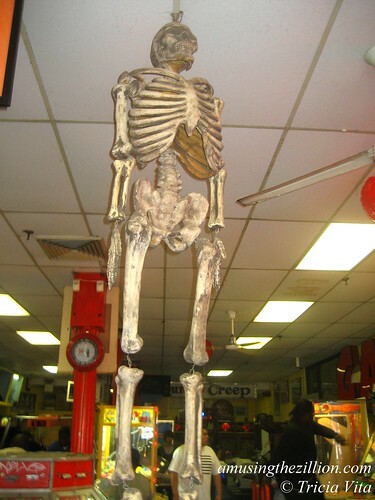 The arcade’s last day of business was Labor Day. On Tuesday, arcade machines were being hauled out and trucked away. The sign is the last vestige of Nat Faber’s arcade empire, which dates back to the 1930’s, though the Fabers got into the business in the early 20th century. The iconic marquee is on the front of the historic Henderson Building, owned by Thor Equities and currently being subjected to pre-demolition asbestos abatement. Faber’s was the last remaining tenant in the building. In 1939, Faber’s Fascination in the Henderson Building got its name written in blazing, chasing lights! By the early 1950’s the arcade was advertised as the only air-conditioned place of its kind in Coney Island. Nat Faber installed 48 new Fascination tables and new balls, and flashed the place with merchandise brought in from Los Angeles. He prided himself on having the top mike man in Coney Island. Faber’s Fortune next door got redone as Faber’s Sportland with Skeeball, Shuffle Alleys and Pokerino. Stan Fox, whose brother operated four arcades in Coney island, recalls Faber telling him, “There isn’t room on the Boardwalk for another arcade.” Stan’s brother coolly replied, “You’d better shut yours down.” In those days, Coney Island was busy enough to accommodate more than one Fascination parlor. In addition to Faber’s, there was Moe’s Fascination operated by Moe and Sadie Silverman. There was Eddie’s Fascination. A lot of people ask Stan Fox, who was Eddie? If you know, please drop us a line. But Faber’s was the one with longevity. The location in the Henderson Building was operated by the Faber family until 1971 or 72. “When Hy Singer bought the building he tripled the rent,” says Fox, who notes that Nat Faber’s son Stanford, then in his 40s, struggled to keep the business going. “I don’t know if it was the stress, but he had a stroke and a few weeks later he died.” While the game Fascination hasn’t been played at the Surf arcade for decades, the sign, and its twin, Faber’s Playland, remained. Somebody, anybody, please rescue the Fascination sign! We contacted Tod Swormstedt, founder of the American Sign Museum in Cincinnati, who assured us that this type of sign can be saved. As we noted yesterday in the comments below, the letters have been removed from the Fascination sign and the two Sportland signs! The signs are being dismantled piece by piece and saved from Thor’s demolition by Carl Muraco, who owns the arcade. He told ATZ that he plans to sell the letters and possibly the entire Fascination sign if there is a buyer for it. The arcade machines are also for sale. We hope that these Coney Island artifacts end up in the collections of people who appreciate them, including the Faber family. We’re happy the arcade owner was able to take down and “save” the signs from demolition. At the same time, it’s heartbreaking to see the building being emptied of tenants and stripped of its personality. The sign on Popeye’s was also removed. It makes the impending date with Thor Equities’ wrecking ball seem that much closer. As soon as the ongoing asbestos abatement is completed and certified, Thor will be able to get a demolition permit. Fascination will be sorely missed. It lit up the block and made magic for many years! Just another nail in Sitts coffin to push him ahead of O’Malley as the most hated man who called Brooklyn home. Nat Faber was my father-in-law. When I was discharged from the US Air Force in 1952, and after becoming engaged to Nat’s daughter Joan, I was “recruited” by Nat to work weekends as a “mike man,” while I was attending LIU as an accounting major). At the same time, my wife worked in Sportland next door. Nat had two sons – Stan – who managed Fascination – and Marty – who managed Sportland. They are both deceased. He also had three daughters – all are alive and well. Fascination (and Coney Island) were exciting places, and I enjoyed my time there very much. Thank you for writing! The Faber story is fascinating. 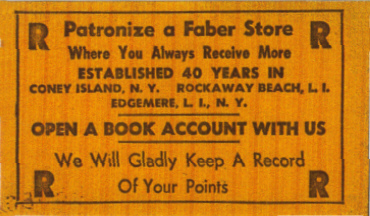 It would be great to have an interview with you & your family about Faber’s in the Coney Island History Project’s online Oral History Archive. This is such upsetting news. Thank you for the great reporting, as usual. I am so upset that this is really happening. I will miss the blinking lights of Faber’s Fascination. It will be surely missed by everyone. Thanks everyone for your comments. 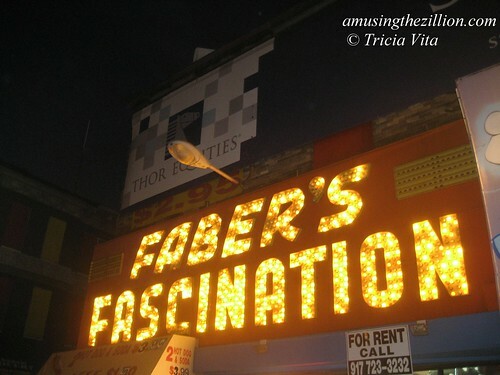 Together with the Eldorado Skooter marquee, Fascination’s gorgeous sign lit up the block. And it was one of the few amusement businesses open year round. In addition to Thor’s impending destruction of the building, the disregard for the livelihood of people whose businesses have been in the building for 25, 30 and 50 years is appalling. The good news is that the letters are being taken down by the arcade owner! There are three signs in total. There are two that say Faber’s Sportland. Wow, that’s a bummer! I was just there on Monday and had I known it was the last day, I would have gone in. I remember the one in Times Square and the one in Long beach quite well, having grown up there. I hate what Joe Sitt is doing to Coney. Thanks for coming out to Coney with your kids! It’s true–after Labor Day = No Lines at Rides! The Fascination letters are being taken down and “saved” by the arcade owner! He will sell them as well as the arcade machines, unless he’s lucky enough to find another space. I am Lillian Faber, Nat’s grandaughter and Stan’s daughter. This story really touched me and brings back many many memories. Memories of the summer’s where I worked at Sportland in Coney Island. Memories of working with my Dad at what I call the Faber Family House in Neponsit Rockaway where merchandise was kept for the various locations. Given the opportunity and space I could write and write about the memories. In fact this article has brought back some that I had forgotten. Not sure if you remember me or not, but we went to Hudde together. I was searching names of old friends on Facebook and came across this article. Now live in the Atlanta area but have brought my daughter to Coney Island a number of times. Sad that Faber’s is no longer there for her to see. It was always one of my favorite destinations when I went there as a kid. In fact the ski-ball technique I have taught her was leanred at Faber’s. This Sinrod is sad to see it all go. Great memories of Saturday’s trying to make an entire dollar last the whole day. The notion of ‘Play Fascination” always conjured up some kind of strange, raw excitement… such was and is the nature of Coney Island. Never really knew the game, just saw it as the definition of the entire place (Coney) Great article Tricia & so sad, so final. I guess the words ” roll the ball, light the lights” won’t mean the same anymore. All that we remember as children will be gone. I forsee a place in hell, next to Fred Trump, Robert Moses, and the schmuck that took the Dodgers to LA, for Joe Sitt. It may sound slightly cheesy but as another member of the family (while I’m not technically a Faber, Nat was still my great-grandfather), I always found more than a bit of pride in seeing Faber’s Fascination still standing every time I stepped off the train in Coney Island. It was also fun to be able to point it out to my friends, who always got a kick out of it. linked you at my joint. This is horrible sickening news. Unbearable, like much of this city has become. on September 14, 2010 at 10:49 pm | Reply R.
It’s very sad stories.. but you have to move on and stop living in the past. These trashy buildings has to be taken down so new modern buildings would be build. i always recall this building with excitement as i actually got to play fascination on downtown market street in san francisco in the mid-nineties so it had some living, breathing meaning to me. i just saw it today with the sign down. boo! i wonder if there is a single fascination parlor left, i’m willing to bet the one in san francisco is not there anymore as san francisco seemed to be facing similar changes to those in nyc. does anyone know? you can always catch a glimpse of faber’s fascination in times square in the opening scene of ‘taxi driver’ where it has been immortalized. I’ve been told one can also play Fascination at Playland-Not- at- the-Beach Museum in Calif. and Knoebels Amusement Park in Pa and a few other parks. Let me know if you get a chance to visit! The San Francisco Fascination parlor is no more. It closed in the early 2000’s, perhaps as late as 2004 or 2005 (I played my last game there in 2001 or 2003 when in town on business). There was also a parlor in Santa Cruz, CA on the boardwalk–that closed in October 2007 (the very day I was arriving there on another trip, but too late to actually make it to play a game). 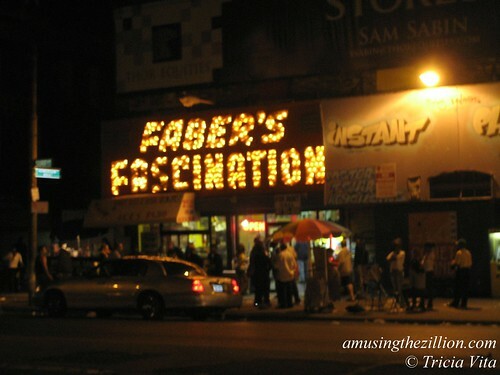 During a visit to Coney Island (2008, maybe), I got excited when I saw the Faber’s Fascination sign, then sadly discovered that Fascination there was also gone. Thanks for the comment on my photo–funny that Google thinks it’s so much more significant than flickr! This is wonderful reportage. Such a shame that so much history is disappearing before our eyes. Our children will have such all this faded beauty in photographs, if at all. 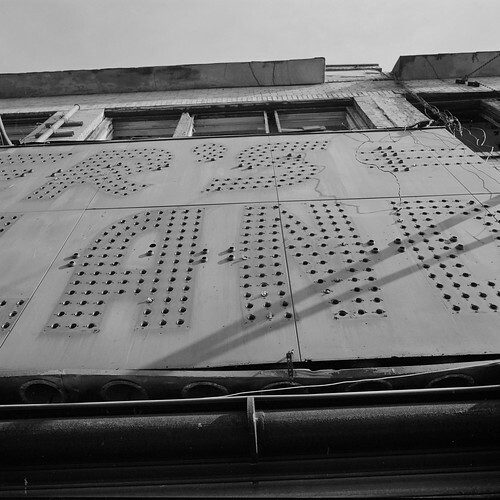 Here’s a link to David’s beautiful B & W photo of the partially removed Fascination sign. Love the angle and the framing! so wait, there is a fascination still in existence in las vegas. is this the only one left? when i was in my early twenties i got to hit the one in san francisco but i’m sure that’s gone by now. does anyone have any written references to the game btw? i did a search a while back online and found basically nothing so it’s always remained a sort of mystery. Wonderful, thanks for sharing your memories! I don’t know if it is mentioned in this article but I took a trip to Hull, Mass, where there is still a Fascination parlor in operation, It was originally brought from Coney Island. From 1955 to 1958, while I was attending Brooklyn College, I worked for a fine boss, Marty Faber of FABER’S SPORTLAND. I was also lucky enough to be with a number very likeable fellow employees: Norman, Burt, Ira, Morty (all about my age) and Meyer, the “older man” among us. I recently saw a picture of my grandmothers on a beach in NYC and on the Boardwalk there was a sign that said FABERS POKER. The picture is from 1944. Did this becomes FABERS Fascination? And does anyone know which beach this was? We had a Faber’s skee ball and knish place on the boardwalk in Long Beach, under the name Izzy’s Knish —who was Izzy Faber….